When I was a little girl all I wanted to do was sing. That was it. No back up plan. No need for one. I was never going to get married. I had no intention of ever having children. I was going to live my life to the fullest with no worries and no others to be responsible for. I was young and I had a dream. For several years following high school I lived that dream, saw this country and visited another doing what I loved to do. Singing. Living my life the way I wanted to live it. Those were great years and if I have any regrets, it would only be one. My regret is that I didn’t push myself harder, didn’t make myself try to get to that next level. I recently went to Nashville, TN for a work related function and I fell in love with that small city and all the people in it. Musician after musician after musician, pursuing their dream and doing what they love, anyway that they can. I met a couple of musicians who sang and played in a number of different bands from nine in the morning until closing time, moving from one establishment to the next. I envied them a little. I can be honest about that. Some have made it big while others are still trying. They are pushing themselves to get to that next level. Well, as most of you know, I did get married and I did have children and I wouldn’t change that for anything. They are amazing! They have made me see life in a new way. I don’t take many things for granted anymore. Life is too short. We need to make the most of all our days and share it with people that we love and doing things we love to do. Now as an adult, I have a new dream. Well, a couple of them. I want my husband to be happy and successful and I want my children to grow up and be good people loving life. My other dream…writing. Writing has changed my life. It has made me more confident, more diligent and well rounded. I have met some amazing people in the writing world, on-line and off, and I cherish them all. It has given me moments of frustration and moments of elation. I relish it all. I love what I’m learning and I love the escape. I love the connection it has given me with my siblings. I love that we are on this journey together even though we’re all at different mile markers of the path. This dream I will pursue to the fullest. I want to be at that next level and will do all in my power to get there. I recently told someone that I am trying to be a writer. This is not true. I am a writer and I will succeed. Dreams don’t always have to be just out of our reach, something we grasp for but never quite connect. Dreams can turn into reality, if we give it everything we got, if we don’t give up and sometimes a little luck can’t hurt either. What was your dream as a child? What is it now? Same or different? Will you succeed? Please share. Well spoken, Barb -- or, more apropos re: your post, well WRITTEN! And you hit upon "the secret" to it all -- you ARE what you SAY you are, as long as you say it with conviction. I WILL say that I hate the thought of you not singing again --- you have a GREAT gift and GREAT talent which I remember fondly (and still listen to recordings of, believe it or not!). Perhaps one day you can be someone like Sam Shepard -- great playwright AND a great actor. So maybe write some, sing some to shake the cobwebs out (of course, Beth would probably be more able to tell you if that's even possible! That old thing about "serving two masters"). My dream as a child was to REMAIN one. I'm a musician --- so, so far, so good! :) "Will I succeed?" Depends on your definition of "success." Especially after my recent NON-musical phase, success to me is not having music be a hobby --- again, so far, so good! Unfortunately, especially in this economy, that kind of success is tenuous, at best. So, ask me again come the Fall;). 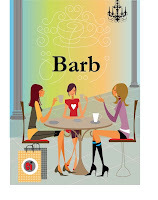 Looking forward to a "good read" from you, Barb! Anytime you get to do something you love...I call that success. In your case, not only does the economy have to turn around but so does the want for real musicians. Too often the talent is sub par. I am more than ready to hear people who can actually play. Oh! and play more than 2 or 3 chords! Ya know?! You are absolutely right. I think I have a new mantra! My first dream was to be Wonder Woman. I would spin around and around in the living room just in case I might somehow turn into a superhero. When I figured out that wouldn't work, (I guess I always knew but you can't blame a girl for trying)I changed my mind and like you, decided to be a singer. Of course I got to live my dream and am on to my next. So, here's to us, singers, writers...dream achievers! Well put Wonder Woman! My Mike's Hard Lemonade clinking your glass of wine! Here's to us! BTW...I love Wonder Woman. She's a real woman! I need that next chapter ASAP! Send it on. I've never wanted to be a singer, which considering how badly I sing is a good thing. My dream? Be happy. Thanks for sharing. All dreams should be as simple and as honest as that. Sing loud and proud in the shower or in your car with the windows rolled down. You'll be amazed at how much of a difference that makes. Late to the party, but I wanted to say how very much I enjoyed this post, Barb. I totally relate. Like you, I only ever dreamed of being a singer. A professional singer. I achieved that goal easily and early on. But, although I had dreams of achieving fame and fortune in that field, I think I lack the proper drive. I worked hard and made a living as a singer/performer for a long time. My passion sustained me for many years... but at some point, the 'business' started to wear me down. About that time, I rediscovered my love of reading--specifically romantic fiction--which spurred a new passion. Writing. I went for it and I've never looked back. The journey thus far has been wondrous, even the rocky parts. As much as I loved singing and performing, I don't think that's what I was meant to do for the long term. I think it was just the artistic springboard to writing. Embrace your new dream and fly! I love that you said "Embrace your new dream and fly!" Another new mantra! That is beautiful!